When Is Housing's Black Friday? While prowling the malls for fantastic deals has become enshrined as a traditional part of many Americans' holiday season, it has long been considered conventional wisdom that this sales fervor doesn't extend to shopping for a home—that there's no deluge of would-be buyers surfing the Web for listings or slogging through the (presumed) snow to open houses. But does the housing market really come to a screeching halt during the holidays? The realtor.com® team decided to put down its Best Buy circulars and Victoria's Secret gift cards long enough to find out for sure. 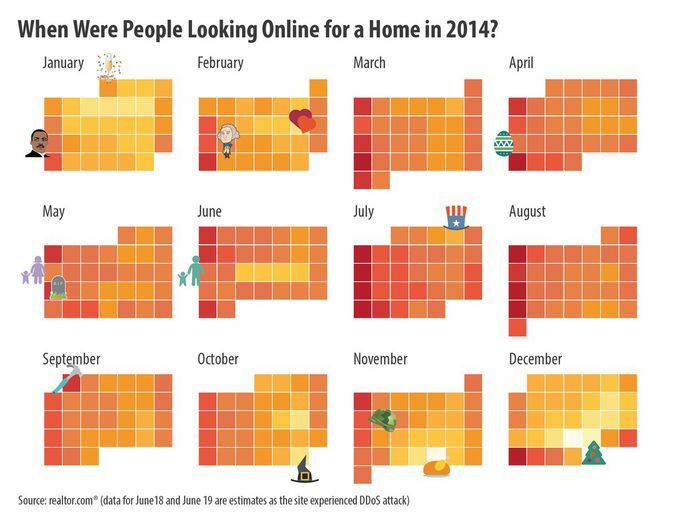 In order to measure people's interest in shopping for a home, we used traffic data on realtor.com from throughout 2014. Not-quite-spoiler: Traffic is much lower on an actual holiday. But what about directly afterwards? And in different parts of the country? 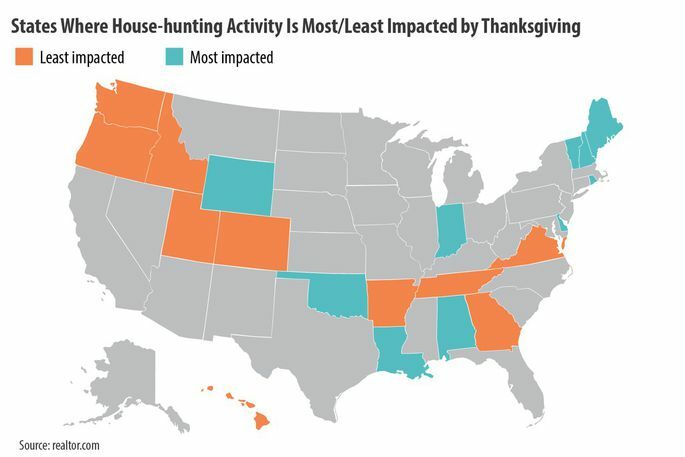 We compared the traffic data for realtor.com on Thanksgiving Day 2014 with that of an average day in 2014's fourth quarter, and then we identified states where house-hunting activity appeared to be most and least impacted by the holiday. In balmy Hawaii, the amount of people house hunting on turkey day is only 10% less than the average for that quarter. However, in New Hampshire, the number is down by almost 60%. And overall, the Thanksgiving slowdown only lasts as long as it takes to digest that huge mass of poultry—and hit a few Black Friday sales. By Saturday, it's pretty much business as usual. 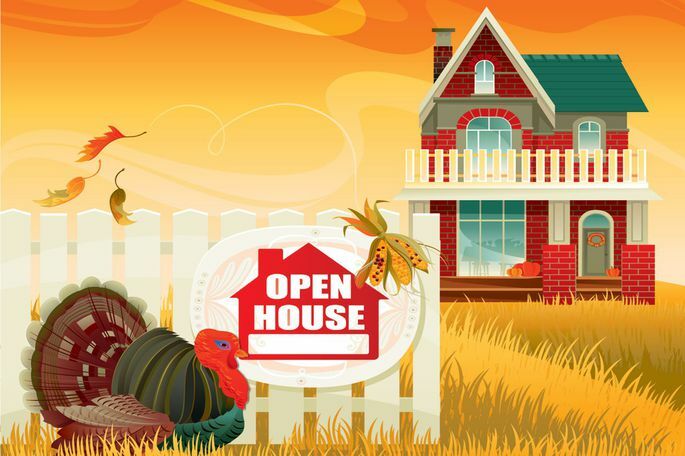 But according to our database, the number of scheduled open houses on the upcoming Thanksgiving weekend is going to be only 6% of the number from this past weekend. 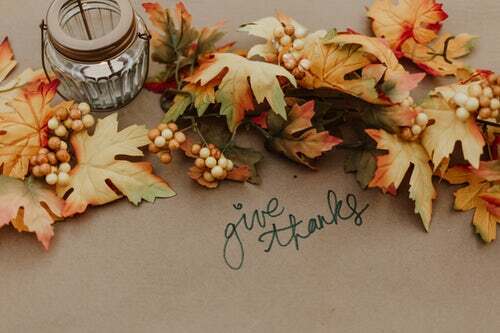 So for buyers serious enough to attend a Thanksgiving open house, your effort will likely pay off—you will be dealing with equally determined sellers and facing less competition. 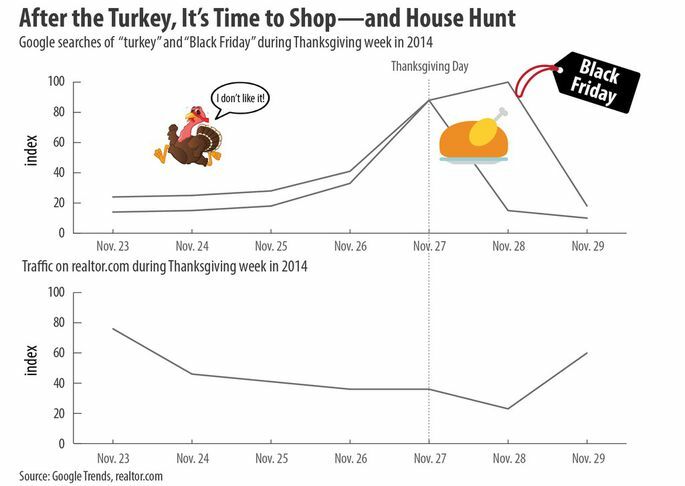 Moving beyond Thanksgiving, we looked at the impact of all major holidays. Take a look at the graphic: Dark red indicates higher traffic, while light yellow indicates lower traffic. So what is the true Black Friday of the housing business? Here's a holiday shocker: Dec. 28 was actually one of the busiest days for real estate searches in the entire year, despite the fact that Dec. 24 was the single slowest. The reason: When we're over the holiday hump but still on break, it's a great time to look for our dream home. The same reason explains the surge of activity on New Year's Day. And, perhaps buying a house is a popular New Year's resolution? Besides family-oriented holidays, there's one more holiday that significantly slows down home-searching activity. Nope, not Mother's Day, not Father's Day, but ... Valentine's Day. Think about it: Your significant other wants to take you out for a romantic dinner. Are you gonna say no because you want to stay at home to browse photos of fixer-uppers?